Public hearings are held on the first Thursday of every month, beginning at 6:15 PM in the Commission Chambers of the PDS Building located in Fort Mitchell. Additional maps and staff reports will be posted here, when available. The Telecommunications Board of Northern Kentucky provides videos of KCPC meetings in the On Demand section of the TBNK website. 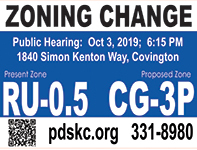 REQUEST: Proposed text amendments to the Erlanger Zoning Ordinance adding private schools to the list of conditional uses within single-family and multi-family residential zones. REQUESTS: Proposed text amendments to the Fort Mitchell Zoning Ordinance: (1) adding a definition for microbreweries; (2) adding microbreweries to the list of permitted uses within the NC (Neighborhood Commercial) Zone; and, (3) amending the outdoor dining regulations within the NC (Neighborhood Commercial) Zone to increase the scope of outdoor dining and to permit entertainment and live music between certain hours when it is not located adjacent to residential property. REQUESTS: Proposed text amendments to the Taylor Mill Zoning Ordinance adding 23 additional permitted uses within the I-4 (Industrial Four River) Zone; these uses include manufacturing, assembly, bottling, brewing, freight terminals, and other heavy industrial uses. REQUESTS: Proposed text amendments to the Ludlow Zoning Ordinance adding marquee signs that are integral to a historic building as a permitted sign within the NC (Neighborhood Commercial) and SFC (Special Function Commercial) Zones, along with development standards for lighting, height, extension, and changeable copy for these signs. LOCATION: 6239 Taylor Mill Road in Independence. REQUEST: Proposed waiver to the requirement of Section 4.2-9 (E) of the Kenton County Subdivision Regulations; granting the request would waive the restriction that no more than two flag lots may be contiguous to each other at the street.